Montecatini has many well preserved buildings of the Liberty Period, that the city suggests to follow a route beginning from Piazza del Popolo in the way to discover all secret beauties of Montecatini. In Viale Verdi it’s possible to visit the Town Hall ended in the year 1920 by Raffaello Brizzi and Luigi Righetti. Inside we find decorations of Galileo Chini and Luigi Arcangeli. Near to the park we find the Leopoldine spa of the eighteenth century almost completely transformed by Ugo Giovannozzi between the 1922 and 1926. 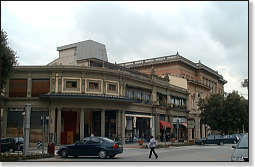 At the end of Viale Verdi there is the building of the Tettuccio spa, rebuilt by Mr Giovannozzi who reassembled the original face inside the building. 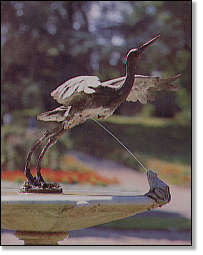 with the subject of the heron and the frog, symbol of Montecatini Terme. 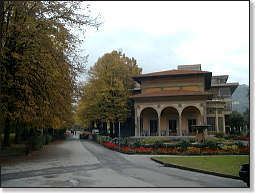 Not very far from the Tettuccio spa, inside the park , it’s possible to visit the Tamerici spa, renovated in the year 1910 by Giulio Bernardini and by Ugo Giusti now seat of the " Circolo Culturale Tamerici". Galileo Chini realized inside the panels, the counters, the glass-window and the floors of the old hall of the bar. Our visit ends by the " Grand Hotel & Pace" built in the second half of the 1800 and more times transformed. In the year 1904 opened the Feast hall with Frescos of the Chini who made also the drawings of the glass windows of the old hall. Inside the city we find many other exemples of Liberty style like the private Villa Agatina on Puccini Street. This villa has glass windows and ceramics decorations of the Chini’s Manufacture. The Villa planed in the year 1919 by the architecte Giustiniani, has a harmonious structure and refined decorations. Another Villa in Liberty style built about in 1920 is called villino de "Il Rinfresco" on IV Novembre street.